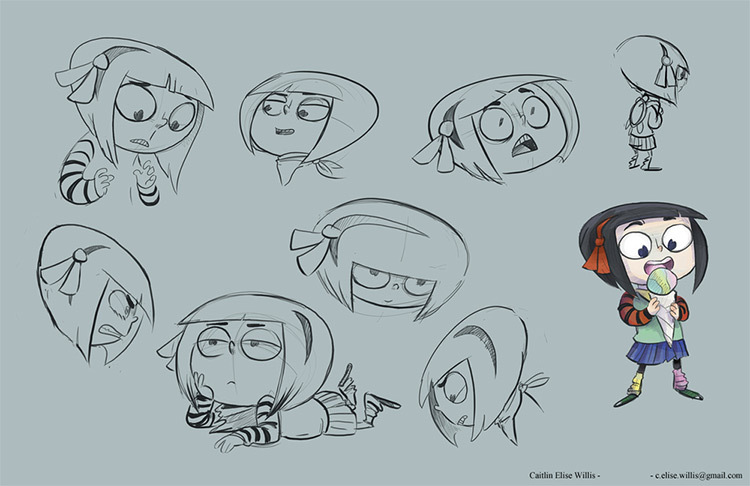 Caitlin Elise Willis(Elise for short) is a terrific artist that was recently accepted into the Nick Artist Program from 2015. 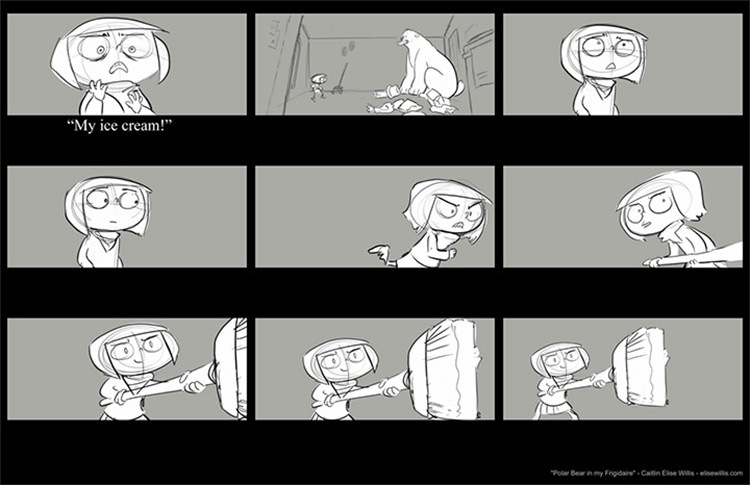 Elise has a real talent for storyboarding which has been used for animation, games, and web comics. She applied to the Nickelodeon Storyboard Track and currently works on the network classic SpongeBob SquarePants. She was nice enough to share info about her life, her artistic journey, and handy bits of advice for fellow artists. To learn more check out her portfolio site to see work samples and her brilliant web comic PekoPeko Cat Cafe. Can you share a little about yourself, your education, and personal interests? My name is Caitlin Elise Willis but you can call me Elise! I’m a storyboard artist living in Los Angeles, California. I graduated from the Savannah College of Art and Design in 2012 with a BFA in Animation, plus a few internships at Nickelodeon and DreamWorks under my belt. I worked at Oddbot Inc for two years storyboarding a variety of pilots and projects. Everything from mobile games to Disney’s Star Darlings! Now I work at Nickelodeon on SpongeBob Squarepants. Wowie! I love creating silly content for kids. I also like cooking a good meal and playing video games. What initially drew you towards art, and what keeps you excited about art today(especially the art of storyboarding)? I grew up in Texas making comics since I could hold a pencil. My first comic was about a boy and his little brother who were superheroes, but they kept it a secret from their parents. I started it the last day of third grade. Wrote it all throughout the summer. It ended up being around 40 full-page panels! I’ve always loved telling stories to anyone who would listen. But there were times I wished I could’ve shown my audience exactly what I saw. Art was a natural answer. That desire hasn’t died yet. And I hope it never does! Along with animation you also make comics. When did you start making comics and are you currently working on your own series? I’ve always made comics through grade school but nothing published. I’d draw comics to make my friends laugh. I made comics to say sorry when I hurt someone’s feelings, and I’d use comics in my assignments when the teacher would let me. 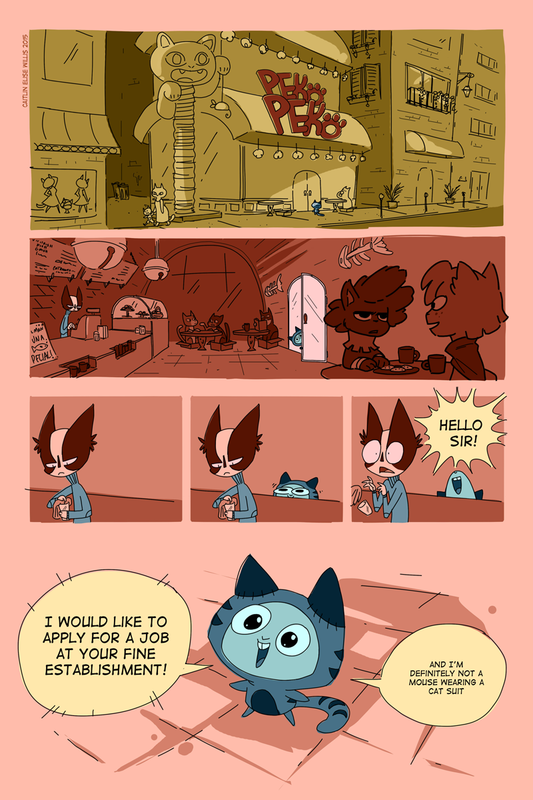 I just recently just finished PekoPeko Cat Cafe, a comic about a mouse who dressed up as a cat in order to work at a cafe where mice are NOT ALLOWED! It’s based slightly on my time working at a cafe in college. You can check out the full comic on my website. Do you find any similarities between making comics and making storyboards? I think comics and storyboards are pretty similar since they both use visual sequences to tell stories. Storyboards, especially for a large animation studio, require more structure since they’re tools used to inform the animation. Comics stand on their own as finished pieces. They can be a little more experimental. Both are really fun and both present unique challenges. 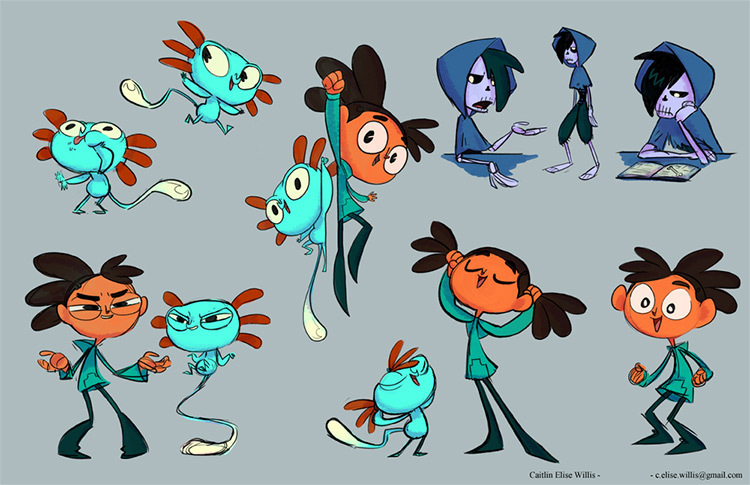 How did you end up studying animation at SCAD? 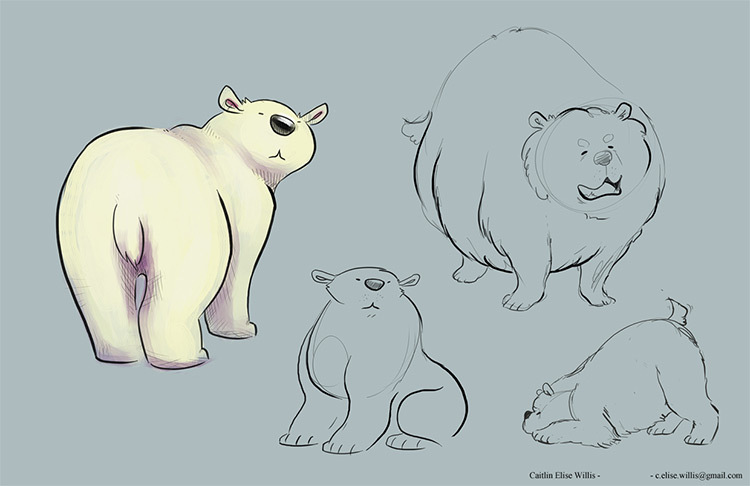 Do you feel school taught you enough prerequisite knowledge for a career in animation? I saw a SCAD catalog in the old magazine bin in my high school art room. I cut some stuff out of it for an art piece I was working on, and started reading it instead of working. I met so many good friends there! I also had a few excellent instructors that really built up the foundation of my art knowledge. I think ultimately I learned more during my time in the industry, though. Looking back it would have been nice to go to school near Los Angeles to be closer to the animation action. Once out of college what was your first real job in the animation industry? My first full-time job was at Oddbot Inc. I applied for a storyboard artist position but didn’t have enough experience. Chris Hamilton, the Creative Director, was kind enough to give me a compositing job after seeing my film East and West(which is effects-heavy). I worked as a compositor for six months. But anytime Chris needed a quick storyboard revision he’d hand it to me as a freelance gig. I worked hard at every opportunity! I even took a Concept Design Academy class with Tron Mai, where I made a whole new storyboard portfolio. At the end of my contract I showed Chris my new portfolio and he hired me as a board artist. Are there any major differences between storyboarding for animation vs. storyboarding for games like iOS applications? Both types of boards inform the placement of the final assets and actions. Apps require you to think about the user experience and place interactive elements accordingly, whereas in animation you focus more on storytelling. So congrats on getting picked in the 2015 Nick Artist Program! What was your experience entering the program? What sort of work did you submit and do you have any suggestions for others who might try to enter? A lot of the art I used for submission is all on my website if you want to take a gander! I submitted three storyboard sequences and a few illustrations of the characters in each sequence. A portfolio should be short and sweet. Insert only your best work! Also use your own characters and stories. Try to board in a way where the audience can tell what’s going on without dialogue. Show your portfolio to friends and ask them for feedback on how clear your stories come across. What was it like joining the SpongeBob team at Nickelodeon? What type of work do you do there? SpongeBob has an amazing, hard-working crew. I actually had an internship with the SpongeBob team a few years back so I was familiar with the faces when I returned via the Nick Artist Program. So far I’ve been revising boards and punching up gags. In your personal opinion, which traits or behaviors make for a great storyboard artist? Be good, fast, and nice. Some people say you can only be two of those three things. I would try for all three! Do you think someone could teach themselves storyboarding or do you think it requires a teacher/mentor? There are so many resources online, it’s really incredible. I think you could definitely learn the technical aspects and terminology of storyboarding on your own. Things like Sherm Cohen’s Storyboarding Secrets blog and programs like Motivarti give artists the resources needed for learning more about their craft no matter where they live. However I think it’d be tough to learn storyboarding in a vacuum. Feedback is really important. Stories are meant to be shared. Finding a community of like-minded people, whether online or in a class, is key to becoming a great storyboard artist. Lastly could you share any final bits of advice for anyone looking to be a professional artist, or for anyone that just wants to learn art in general? Grow a thick skin for criticism. Critique is important for any artist’s development. The most important thing, though, is making art. Special thanks to Elise for taking time out for this incredible Q&A. I hope her story offers advice and inspiration for every aspiring artist. You can see more work on her portfolio site or her Tumblr page. And you can find even more random art posted to her Instagram and on Twitter @caiwillis.